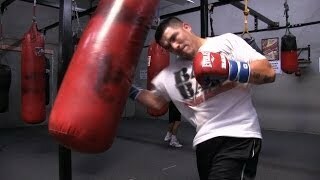 World class techniques & strategies for elite boxers. Mayweather counter-punching combinations. Fight analysis, blueprints, game plan execution. Marcos Villegas discusses and reacts to the upset win of Marcos Maidana over Adrien Broner tonight in San Antonio, TX. Danny Garcia “I believe I can beat anyone in the world” talks fighting Floyd Mayweather Jr.
Danny and Angel Garcia talk about the topic of what is next for him and thoughts on fighting Floyd Mayweather Jr.
Gennady Golovkin performing his media workout in preparation for Golovkin vs Stevens featuring some extra promotional footage. Brandon Rios hits the heavy bags and shadow boxes a bit as he prepares for Manny Pacquiao. Check out Miguel Cotto hit the mitts with Freddie Roach in preparation for his bout with Delvin Rodriguez. Marcos Villegas speaks to Brandon Rios about his fight with Manny Pacquiao as Rios tells us why he will retire Pacquiao.